We seek pleasure in the worldly things that we aim for and then when we achieve the same, we are on cloud 9. Sometimes, I wonder why we do so? When all we need to do is seek pleasures and happiness in the smallest of the things that we do. We have only one life to explore, unless you believe in the concept of reincarnation. Also, I agree, that different individuals have different aspirations and then they want to achieve them, they want to be labelled as achievers and to be seen as successful individuals but what actually makes them content? Where does one find contentment and satisfaction in life? Where does one seek them? It's difficult to think or answer on everyone's behalf, but isn't difficult as an attempt to be content with what you have, living in the moment and moving on, though chasing your dreams should always be a part of the small moments that you see and cherish. 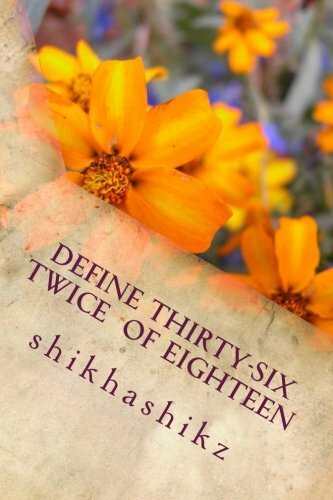 I recently read Define Thirty-Six, Twice Of Eighteen, a debut book by author Shikha Pakhide aka shikhashikz. The author calls the book as the collection of the shortest stories, which they are. And if you are wondering what's with the title? It's all about Mathematics. Well, NO! Shikha answers this question in the quote below. I turned 36 this year ( and I am not shy to reveal my age ). Initial months of 2016 was when I decided that it's high time that I put my personal goal into action, and I started working on this piece. When you are 18, you are free to take your decisions and venture into a new horizon. Probably for me, the second innings of 18 enabled me to work on my dream project. That's how this title came into being and the flash stories ! When I started reading Define Thirty-Six, Twice Of Eighteen, I expected the stories to be straight to the point kind of stories, which they are. Some stories were as short as two pages, interesting? Yes. Shikha has done a good job with the stories, keeping them minimal in the settings, the characters involved and the narration. Every single story is different from other, which, ideally should be, but what impressed me about the book was the neatness in the emotions at display. Though fiction, all the stories depict some kind of reality in one or the other form, making them easy to relate to the everyday world we live in. The stories talk about ambition, success, wants, needs, love, work, travel and the journey around it, one's ability and almost every other attribute that one would want themselves to be associated with. The stories in Define Thirty-Six, Twice Of Eighteen, are easy to go with any age group and is a kind of multi-genre writing, so it has something or the other for everyone. Define Thirty-Six, Twice Of Eighteen would not be ideal for someone who is looking for drama, suspense or thriller in the stories, but I would recommend it anyone who is looking for a quick read in the fiction and short stories, in Shikha's words short-est stories.